I will give a brief description of the materials used on each page. 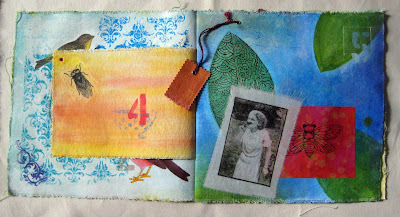 On the first page there are leaves cut and painted from a phone book page with a leaf cut from a leftover of my mixed media quilt Illustrated Document No. 1. 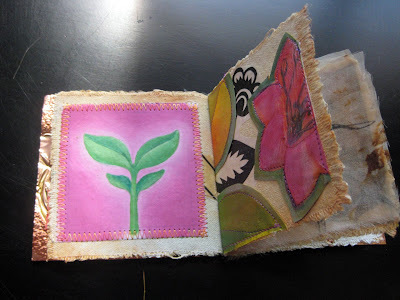 Sprout painted with textile paint on fabric, next page black and white tissue paper and left overs from a mixed media vessel. 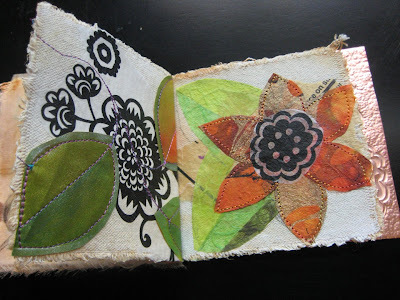 Collaged, painted paper overlapped by painted flower on the canvas. 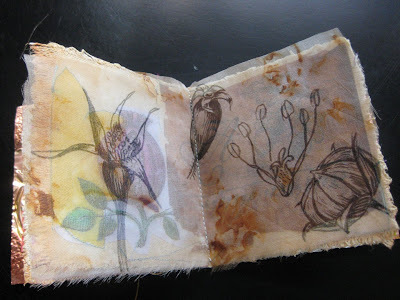 A piece of rust dyed silk organza from Jane LaFazio that I drew floral images on with a permanent marker. Dark tea stained tea bag drawn on with permanent marker. Another leaf from the vessel, black and white tissue paper and colored art papers. Tea bag drawn on with a red marker collaged over a paper image. 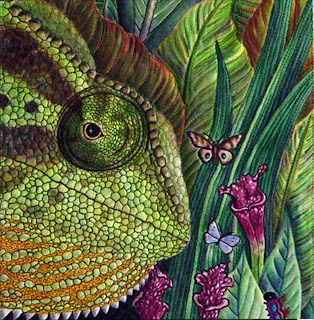 Painted leaves and a strange bug I created in photoshop printed on paper with some washes of acrylic paint. Old engravings on paper, painted with fluid acrylics and leaves cut from painted fabric leftovers. 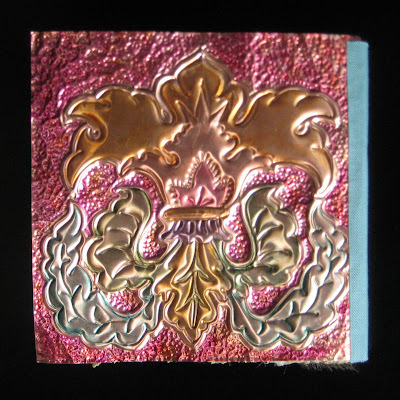 I will be working on the metal for the next book in Open Studios at Quilt Festival, so you will have to wait to see the next one. Fiber Art for A Cause earned $6,250 for the American Cancer Society! This is better than anyone could have imagined and a great addition to the $165,000 that Virginia has raised so far. Thank you, thank you to all those special people out there who made it possible! 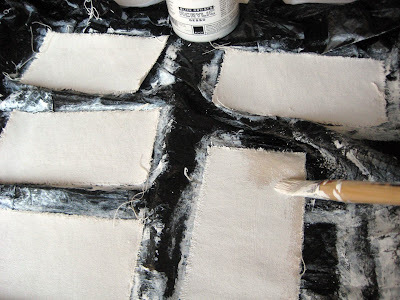 I began by tearing canvas into 4" x 8 " pieces and painting both sides with gesso. I think if I were to start again I would tear them into 4 " x 8 1/2" pieces to allow for the bulk of paint and collage. When the pages were folded in half the book got fairly fat and the pages were a little short in width. I painted the pages with fluid acrylic washes. 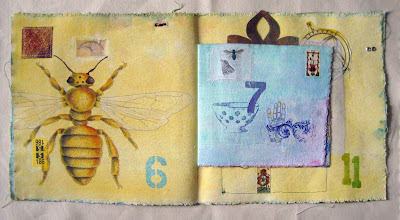 These are the semi finished pages for two books, the blue on the left will be Birds & Bees the yellow on the right is Flora. 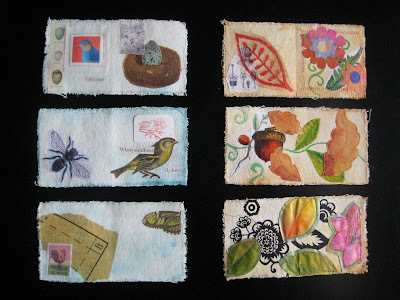 There are images that are drawn, painted and transfered onto tea bags, pieces of rice paper, printed tissue paper, wrapping paper, pieces of painted fabric, scraps from other projects, transfers on fabric, painted canvas and a sewing pattern. All adhered with gel medium and machine stitching. I folded the canvas pages in half and clamped them to help set the fold. I tore 4" x 2" strips of canvas to use on the binding. 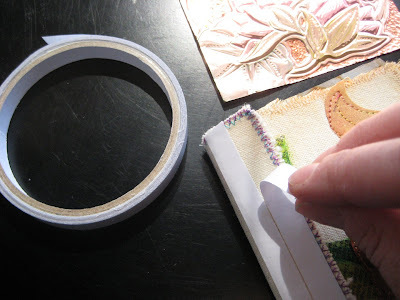 Since the canvas was not painted I did some zigzag stitching around the edge, then positioned it over the center of the stack of pages, taping it in place to secure it for stitching. I stitched through the four layers on my Bernina sewing machine (my Janome would not sew through the bulk). I clamped the stitched book again to help it hold the fold. Walnut Hollow sells a very strong double sided tape to adhere the metal to other surfaces. I found that it will even stick to canvas. 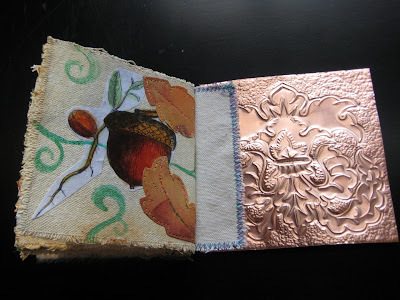 I attached the tape and burnished it well to the canvas and then peeled away the paper backing to stick it to the metal, burnishing it to make a good bond with the metal. 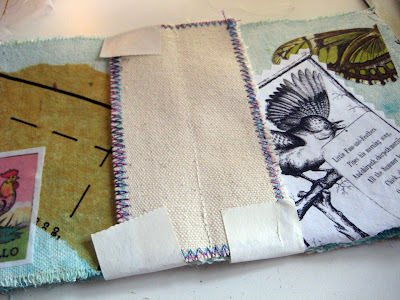 I finished the binding by adding some cloth book binding tape. My next post will show the whole book page by page. The Donations are coming in! Here's an uplifting note in a time when we have felt so down about the economy. 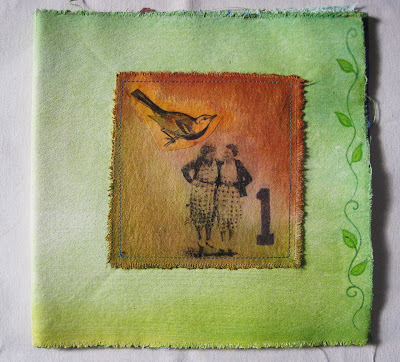 Fiber Art For A Cause is off to a fabulous start with two pieces sold on opening day and another two this morning. Linda Teddlie Minton's artwork raised $1800, Rayna Gilman's - $1600, Marjorie DeQuincy's - $800 and mine - $450 for the fight against cancer. That's an incredible start to this fundraiser! Tomorrow is the last day of the Reverse Auction and the minimum donation will drop by another third. Will the artwork you desire still be there??? 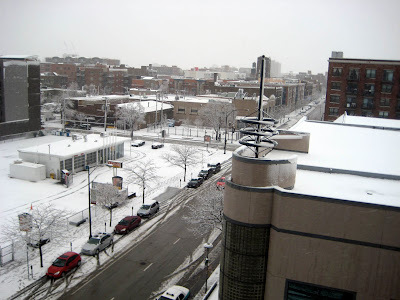 Donations are made directly to the American Cancer Society with an immediate electronic receipt sent to donors. Thank you for your support of Fiberart For A Cause, fundraising for the American Cancer Society. 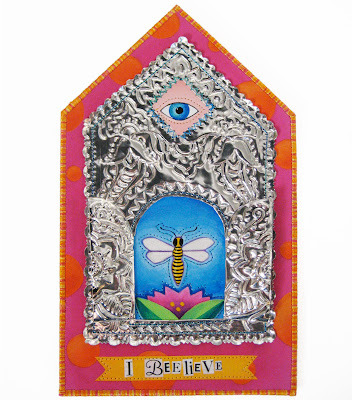 The Fifth and Final Reverse Auction featuring my artwork "I Beelieve" opens today at 10 a.m. CST. 100% of the proceeds are donated directly to the American Cancer Society through Fiberart For A Cause. The minimum donation drops each day; wait too long and my artwork might be gone! 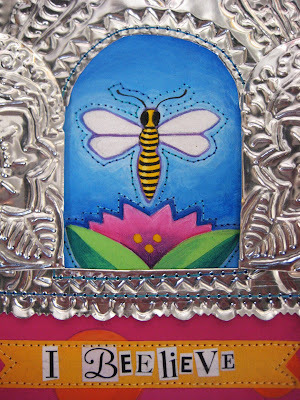 This is the bee panel partially done. In this photo I have gone over all my lines on the front side of the metal with the pointed stylus and begun adding some stippling with the tiny ball stylus to the background on the left side. This helps the image to pop up and be defined. In the next photo, the metal design is finished. The raised areas of the design are worked from the back side of the metal. On the bees wings and the leaves, I used a large ball shaped stylus to give extra dimension. The tool kit from Walnut Hollow has a lot of different metal working tools to add texture and shaping to the metal. I have only used a few of the tools so far as I figure out how each one can be used. It is an awesome little kit with a ruler, scissors, two tool handles with multiple tips that screw into both ends and a couple plastic embossed border shape plates that metal can be burnished over with a paper stump. I like to make my own designs , so I haven't used those, but they are nice patterns. All in all it is everything you would need to do some serious metal work. 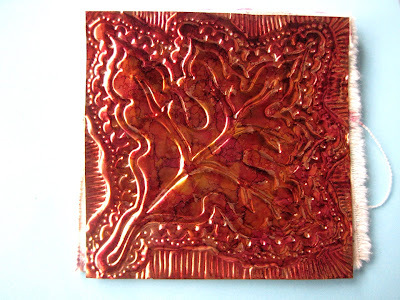 This is a design I made on a piece of copper metal using the Alcohol Inks, the felt pad tool and the blending solution. 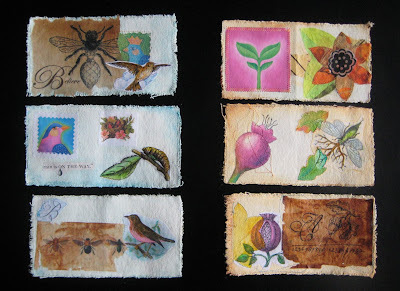 Here is a great little video with Tim Holtz demonstrating alcohol inks. 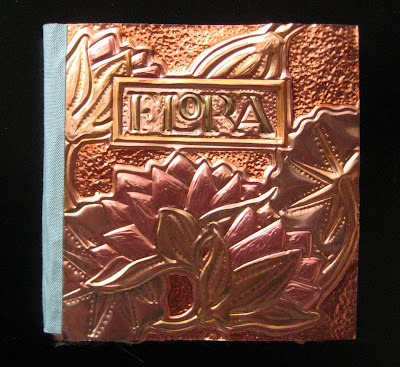 I am working on making a couple small canvas books with copper metal covers. 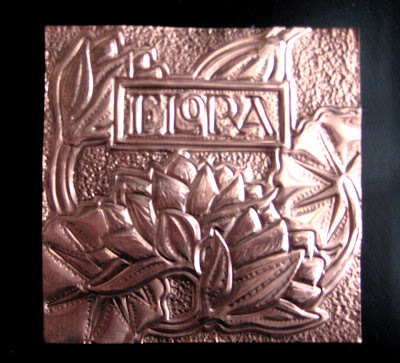 I am using 4 inch square copper metal, it is a heavier weight metal than the aluminum I use for Fiesta Ornaments. 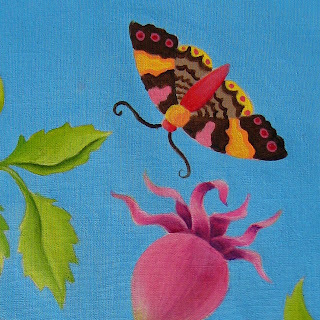 I have drawn several designs to use for front and back covers for two books, one titled Flora, the other Birds & Bees. I begin by taping the metal to a foam mat and then taping the drawing in place over the metal. 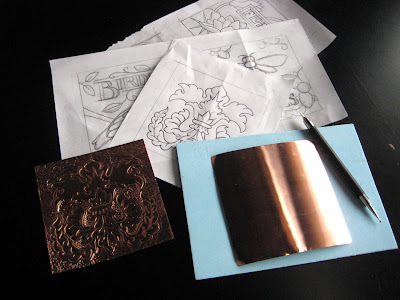 I transfer my image to the metal by tracing over my pencil lines with an embossing tool. 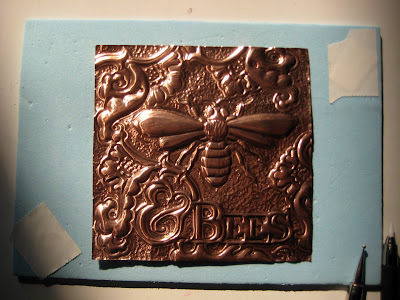 I remove the paper and use the embossing tool to deepen the lines on the metal and add details by working on the front and the back side of the metal, creating dimension. 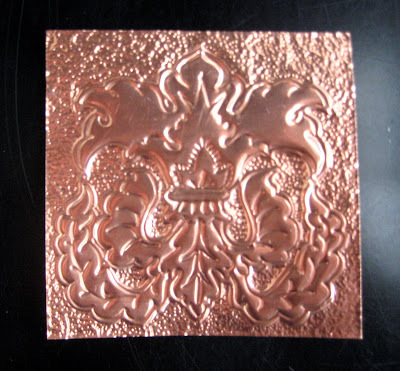 I like to make a small outline around my whole design and fill in the background with stippling by tapping the point of the tool repeatedly over the surface of the copper. This helps the main design stand out from the background. I found the best product to color metal is Adirondack Alcohol Inks. 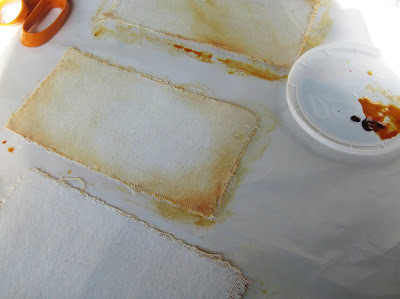 You can apply inks using a felt pad or paint brush. I wanted to paint color in specific areas so I used a brush to apply the ink. 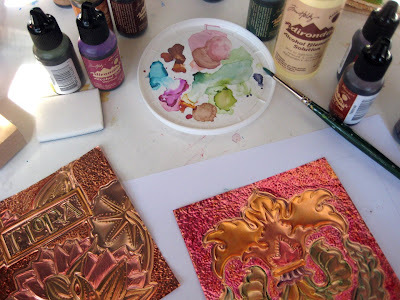 You don't need much when working with the inks, just drop a few drops of ink onto a paint tray and use a paint brush to apply the ink to the metal. The ink goes on very bright. If you decide that you want less color, dip your brush in a little of the Alcohol Ink Blending Solution and go back over the area previously painted and the color becomes lighter as it removes the ink. 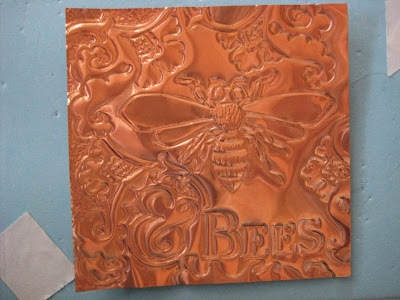 Or you can add the blending solution to the ink on the tray and lighten it before painting it on the metal. The inks dry very quickly and can be reconstituted in the tray by adding a little blending solution. To rinse my brush between colors I dipped it in the alcohol blending solution and wiped it on a paper towel. 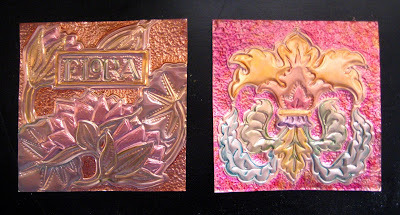 On the copper design with the waterlilies I lightened the ink to make a soft pastel tint on the copper and I painted the ornate floral design brightly to look more like the metal ornaments you see in Mexico. Natalya Aikens, Gerrie Congdon, Marjorie DeQuincy, Rayna Gillman, Carol Larson, Linda Teddlie Minton, Susie Monday, Judy Coates Perez, Leandra Spangler and Roxane Stoner have all donated their artwork. All proceeds from the sales go directly to the American Cancer Society. 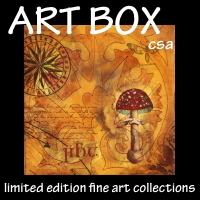 All artwork will begin at a fixed minimum donation. This minimum donation is reduced by a fixed (and very generous) percentage of the original minimum donation each day until the artwork is chosen by a generous patron. “Having lost my husband to cancer nine years ago, I wanted to make some small contribution to something that is so close to my own heart, as well as a joyful way to remember my husband and other friends and relatives who have fought this disease. Since fiber art is both my vocation and my avocation, this seemed a perfect match for me. I was honored to be asked to contribute to the Invitational Reverse Auction, and delighted to accept,” said Linda Teddlie Minton. Fiberart For A Cause has now donated more than $165,000 to the American Cancer Society in the last four years and was the second highest national fundraiser for the 2007 American Cancer Society Cancer’s Relay for Life. 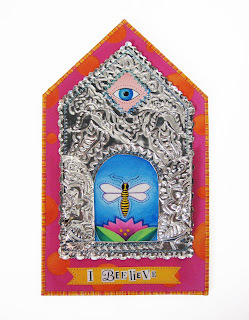 For more information on Invitational Reverse Auction and Fiberart For A Cause, contact Virginia@VirginiaSpiegel.com. Please go visit the website on Tuesday and place a bid on a piece of art for this worthy cause. Just a reminder that I will be teaching two classes at the International Quilt Festival Chicago in April. In this class we will cover a variety of painting techniques such as creating smooth gradations of color, glazing and adding fine details, with lots of tips for getting the best results from different types of paint. I would love to have you in one of my classes, check your Quilt Festival catalog and sign up now. 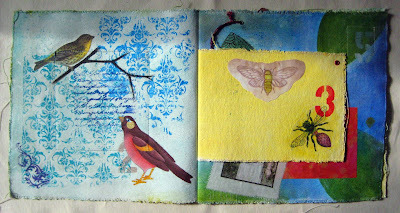 Last month I made a canvas book after seeing Jane LaFazio's segment on Quiting Arts TV. 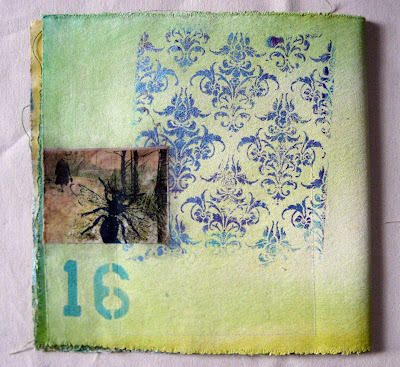 Jane used artist canvas as a base for a mixed media collage. I have not worked much on canvas and thought it would be a lot of fun to try using it as a base for a book. I bought a yard of canvas at the art store and tore it into two 12" x 24" strips and two 6" x 16" strips and painted a coat of Gesso on each side of the canvas. Gesso creates a surface to paint on, so all your paint doesn't soak into the canvas. Next I put color on each side of the canvas, so I would not be working on blank pages. A blank white page can be so intimidating. 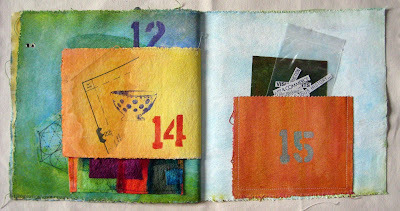 I also collaged some paper images onto the pages with gel medium and stitched a couple pieces of painted canvas to the pages. Then I stacked the pages together and sewed them together on the sewing machine. I found that my Janome was not happy sewing through the layers of canvas, but the Bernina plowed right through four layers of painted canvas with no problem. 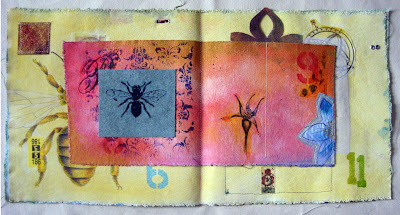 This book was not meant to have a theme, just be a place to try new things, new techniques and randomly add things, a continuous work in progress. 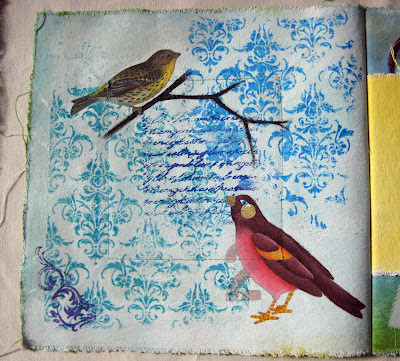 This page has a paper bird from wrapping paper in the upper corner and a painted bird in the bottom corner, painted with textile paints. The patterns and text were printed with thermofax. I had never printed with thermofax screens before. The images printed a little more distressed on the bumpy surface of the canvas. 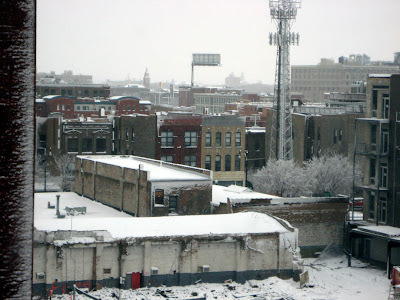 But I love the layer of texture. I can see why so many people love working with thermofax screens. The photos of the women, here, on the cover and the back of the book are from acetate transfers using matte medium that Lesley Riley gave me. 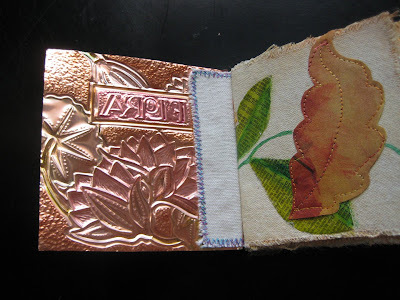 The one on this page was transferred onto a piece of buckram. 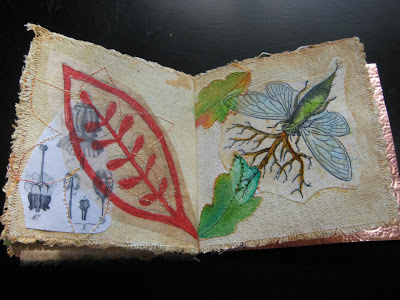 The cicada drawn on the red fabric and the patterns drawn on the leaf were made using a ruling pen. 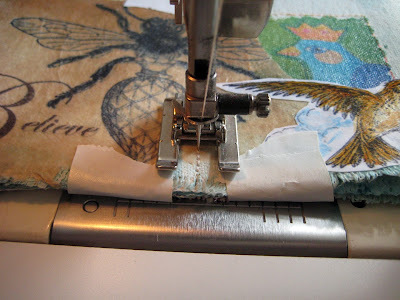 This was a great tip from Melanie Testa, I had forgotten all about ruling pens. I used to use them all the time years ago for inking things. I have several of them that have sat unused in a box for the last 20 years. I even have my dad's ruling pen and drafting tools that he used in his days as an engineer for the Navy. I am thrilled to rediscover the ruling pen, it is a great tool for drawing fine lines with paint or thickened dye. 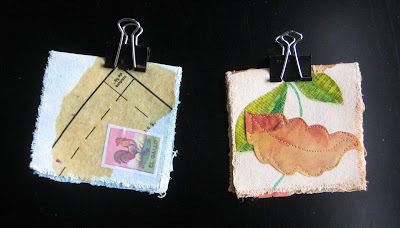 In Jane's QATV segment she also used stencils to add more visual texture to her collages. When I was at Blick I saw a set for $2.99 how could I resist? 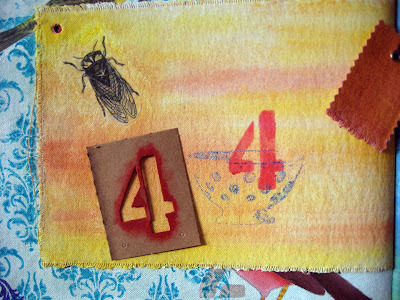 I numbered my pages with them using the number as a design element on each page. 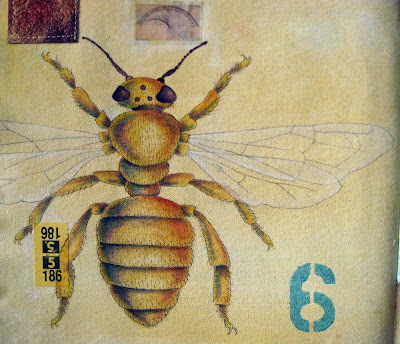 I drew the bee on the page with a permanent brown pen and painted it using transparent glazes of textile paint. This center page has a thermofax print on a piece of wool felt and a scrap from the fabric I made to create the apron I posted about a couple weeks ago. 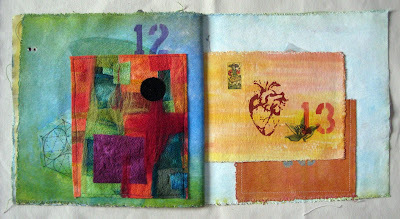 On page 12 I sewed a machine felted fabric collage. 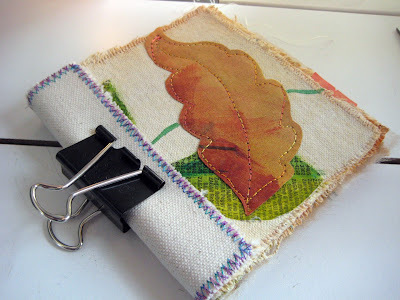 On my last page I sewed a pocket so that I could keep things I want to add to the book in the future. This book is still far from finished, I am planning to keep adding to it indefinitely. It has been a fun experiment, canvas takes paint so differently from fabric. 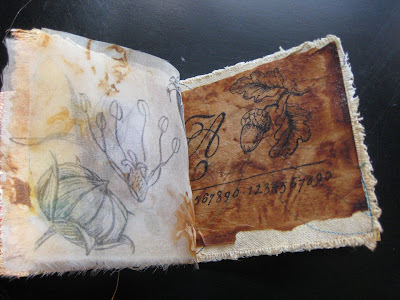 You can push paint around on its surface and pick it up again with a cloth making interesting textures in ways that you can't on cotton fabric. 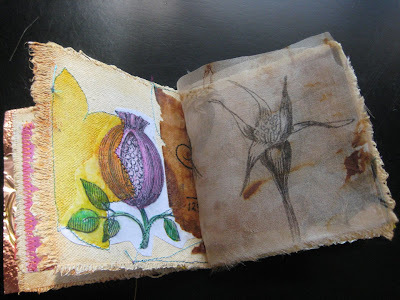 I also like the body the canvas has for book pages, flexible, yet sturdy. I can see a lot of ways one could explore using canvas for books.